Nils Leonard, Grey London's chairman and chief creative officer, art directed the agency's new outdoor campaign for Tate Britain. 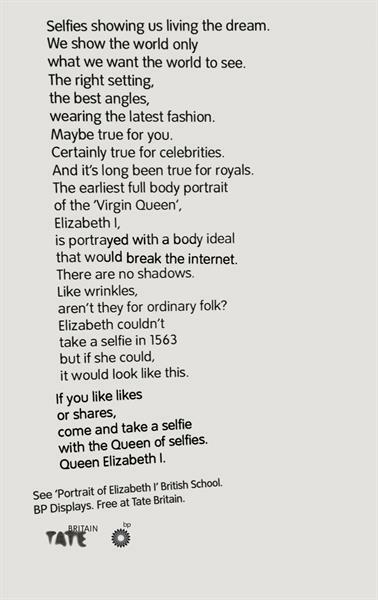 The long-copy ads tell the story behind several works of art in the Tate’s BP collection – a portrait of Elizabeth I, Sir John Everett Millais’ Ophelia and Francis Bacon’s 1972 Triptych. They were written by Pete Gatley, Jonas Roth and Rasmus Smith-Bec. Each poster picks an angle and then elaborates on it in an attempt to pique the interest of new audiences. The ads will run as posters on the Tube and will be given away as postcards inside the Tate.